Imperial Court is preparing for war. Despite the silence of the government since the Imperial Diet was dissolved last week, the Imperial Court has watched, apprehensively, the Emperor’s Office study the prospects of responding to the continuing moral aggressions perpetrated by the judiciary authorities. It is possible that more severe actions will be taken soon. 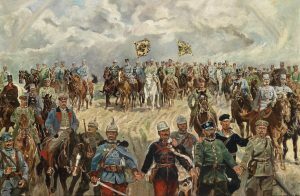 For national history, the whole event is already treated like as the Juznoslavia War, considering the description of the article written for the Libertian Archives, which can be read here.